If you want to enrol, select the date on which you want your name recorded in the official register of the MI, preferably a ﻿﻿﻿﻿﻿﻿﻿﻿﻿﻿﻿Marian feast﻿﻿ ﻿﻿﻿﻿﻿﻿﻿﻿﻿﻿﻿﻿ ﻿Marian feast ﻿﻿day and on the day of your enrolment recite the ﻿﻿﻿official act of consecration.﻿﻿﻿ Then, complete the enrolment application and post to The Crusade Centre in Manchester (National Crusade Centre, Redclyffe Road, Urmston, Manchester, M41 7LG, UK). The Brothers will send you your membership booklet, your certificate, prayers and Miraculous Medal free of charge. As a Crusader of Mary Immaculate, you will be included in all the special graces and indulgencies awarded by the Church to the Crusade. As a visible sign, you need to wear the Miraculous Medal of Mary Immaculate. The Medal owes its origins to the apparitions of the Blessed Virgin Mary in Paris in 1830. 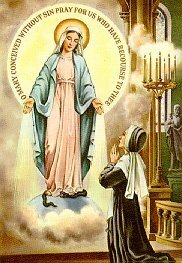 She appeared to Catherine Labouré, showing the young nun and future saint the design of the medal and promised untold graces given to those who wear it. "Have a Medal struck after this model. All who wear it will receive great graces; they should wear it around the neck. Graces will abound for those who wear it with confidence."